Shawn Burns stood near the spot where he helped rescue Sydney Corcoran last year. It was the first thing Sergeant Shawn Burns saw with any clarity in the moments after the bombs went off: a young woman with a tangle of long black hair lying pale and still in a spreading pool of blood. Two men crouched over her, pressing a cloth into her right inner thigh. Her femoral artery, he thought. A potentially lethal wound. He knelt with the men outside Marathon Sports, examined the wound, and told them that whatever they did, they must not move their hands. He took her face in his hands, moved closer until they were inches apart, and asked her name. Frantic first responders and spectators ran around them, yelling for help and screaming, and in the chaos, Sydney’s voice was just above a whisper. But he thought if he could keep her talking, he could keep her conscious — and alive. He told her she was doing great, that Boston has the best hospitals in the world, that she just had to focus on him. The final group of runners finished the 3,328-mile cross-country relay called One Run, which began March 16 in Santa Monica, on Boylston Street Sunday. Burns, now 42, had been on the force for 12 years by last April 15 and considered himself a good street cop. He had worked in Roxbury, Jamaica Plain, and Mattapan, and thought he had seen it all. But as he hovered over a teenager he knew only as Sydney, unsure if he was keeping her alive or comforting her as she died, he felt terror and anger and kinship. EMTs arrived with a gurney, and Burns raced down Boylston Street with them, screaming for people to get out of the way and clutching Sydney’s purse to his chest hoping that someone down the line might be able to find her name in it and contact her parents. He wanted to go with her to the hospital, but knew that as a sergeant, he was needed on scene. “They put her in the ambulance, closed the doors, and off they went,” he remembered, pointing down Boylston Street and staring into the distance as if he were watching her leave all over again. He remembers standing there and looking down at his hands, surprised to see them shaking. In that moment, he believed Sydney Corcoran may have just died in his arms. For days, he would think of nothing else. “Until I found her, she almost consumed me,” he said. Late that Monday night, Burns got a call from his wife, who was in New York City with their two children. They had recently moved to Pembroke from Dorchester, where they had lived down the street from the Richard family. Burns’s daughter was the same age as Martin Richard, 8, who died in one of the explosions, and they had attended the same school. He cried as he remembered his wife telling him that their sweet neighbor was killed in the bombing, curling his hand into a fist and jabbing it forward. “To find out that it was young Martin. My heart . . . ” he said. It was the final knockout blow. The next week and a half was a blur. Burns did not have time to read the newspaper or watch television news. He did not see the picture of Sydney Corcoran lying on the ground with her eyes closed, the two men kneeling over her, until about 10 one night more than a week after the bombing when he finally decided he had to look up news stories about her. It was the first time he learned her full name, that the major artery in her right thigh had been severed but she had kept her leg, that her mother, Celeste, had lost both her legs in the explosion. He put on his uniform and drove to Boston Medical Center, but the family did not want to be disturbed. He returned the next morning. The family wanted to know everything about that day. When he tried to get up and get out of their way, Celeste was adamant that he stay. He was there for hours. “I became a Corcoran right there and then,” he said. 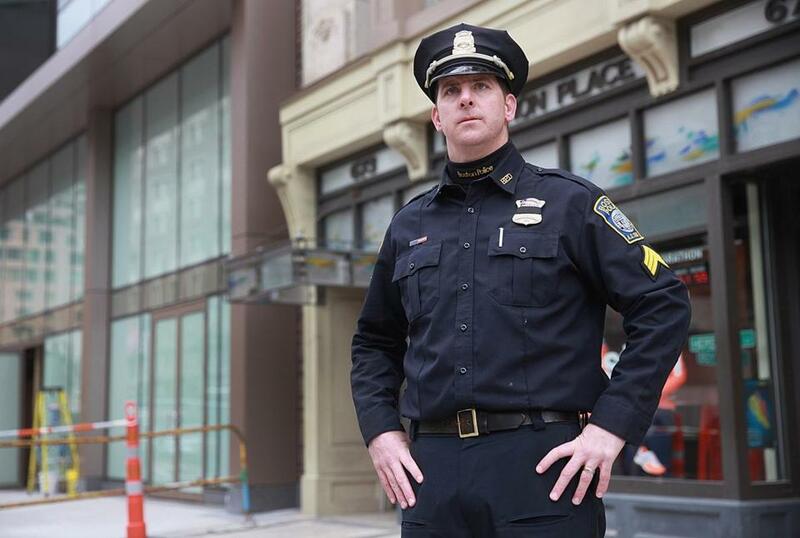 Burns’s fellow officers know him as a good cop, all heart, who connects easily with the young people he deals with so often as patrol supervisor of the midnight shift in the Allston and Brighton district. That he would stay by Sydney’s side surprised no one. “It absolutely fits in with his empathy and caring and protectiveness about people,” said District Captain Wayne Lanchester. The Corcoran family could not be reached for comment. Burns doesn’t expect to ever leave the bombing behind. When he takes his children to a ballgame, the twin blasts are right there in his mind. When he is on duty, he carries about 15 tourniquets in his gear bag, right on top. Another sits in his office mailbox. But that first meeting with the Corcorans helped him heal, he said. They see each other at charity events, and he and Sydney text regularly. When he is having a good day, he’ll send her a message: “Thinking of you.” She’s quick to answer that she is thinking of him, too. Burns has never been a runner, but this year, he will race in the Boston Marathon. He got his number from the Boston Police Runner’s Club and joined Team Corcoran. He is looking forward to getting past the anniversary of the bombing and having a cookout soon with his family, the Corcorans, and the two men who helped him save Sydney’s life, whom he now calls his brothers and heroes. On Friday, sitting feet from the finish line, he smiled and said he can’t wait for Marathon Monday.